Normally finding some specify information,we need go to these website before can make the enquiries,such as Youtube searching for video,eBay searching for goods,etc.You will feel inconvenient.Is there any method to use Firefox searching website with specified keywords ? Yes Firefox has this function to make ours more convenient. 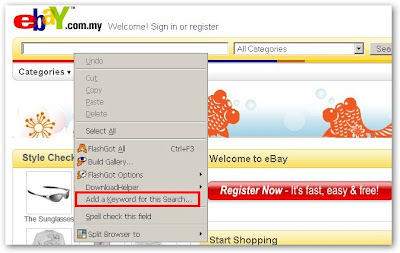 Step 2 :Firefox will pop up a window,enter the name ( such as eBay Malaysia) and keyword ( such as eb) and then click OK. Step 3 : Now in the Firefox address bar key in ‘eb handphone’ and watching what will happen. You can use the above method if have other favorite website.